INNOVATIVE ONLINE BOOK TOURS PRESENTS: SIMON BY V.A. DOLD COVER REVEAL REVIEW AND GIVEWAY! BLURB:NOTE: Complete novel. No cliffhanger. Dual POV. Rated 18+ for language and strong sexual content. Rose is a beautiful, voluptuous woman with limited experience with men. Although she's confident, she still has reservations. Never having a family of her own,her fear of abandonment has her fleeing romantic relationships, and doubting herself. 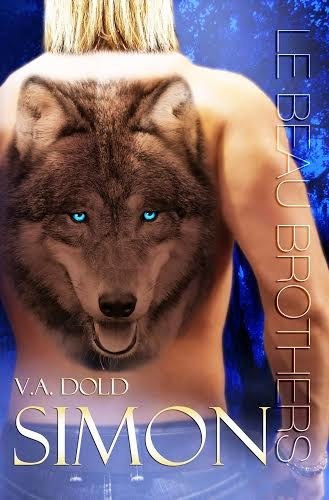 Simon – Le Beau Brothers- By V.A. Dold is a 2014 V.A. Dold publication. I was provided a copy of this book in exchange for an honest review. Simon is an emotionally wounded man due to his time in a special ops organization during his time as a Marine. His special precognitive abilities made a very useful source. Now he is back home but his experiences changed him. Thankfully the Goddess has found Simon a mate, even though he is sort of cutting in front of his older brothers in line. “Fate doesn't work in chronological order. There's nothing type 'A' about fate. Fate does what it wants, when it wants, where it wants, and to whomever it wants. You can't control fate, it just is" Rose is alone in the world, but she and Anna are good friends. Rose has a little trouble with her confidence because she is naturally curvy, and not stick thin. So, although she senses a connection between herself and Simon, she isn't convinced he is attracted to her or that he will be her HEA. In fact, she pretty positive she's going to end up with a broken heart. Simon is having doubts about getting involved with Rose. She is human and he is having difficulty controlling his shifting. Until he has himself under control he is trying not to pursue her. The game changes though when it looks like someone else has set their sights on Rose. When Rose is attacked in the French Quarter, she gets her first lesson about the paranormal realm. When a shifter named Travis crosses their paths trouble starts in earnest. Travis is a blocker as well as a shifter and can keep a shifter from using their gift, and prevent one mate from speaking to the other telepathically. Will Travis manage to come between Simon and Rose? Just like in the first book in the Le Beau series- "Cade", V. A. Dold is able to create hero that will have women melting like butter. Simon is very Alpha of course, but he is also a flawed character with deep sensitivities He is only happy when he has Rose with him and he will fight to the death to keep her safe. Sometimes during a series the reader is only given minor updates on characters from previous installments, but, the author actually gives Anna and Cade a fairly meaty role in this one. Rose gains strength and confidence by being with Simon, but also by helping Simon with his problems and by finally realizing he loves her no matter what. good love story with action, danger and suspense to go along with the steamy Louisiana romance and super HOT Le Beau brothers. Overall this one is 3.5 stars rounded to 4.